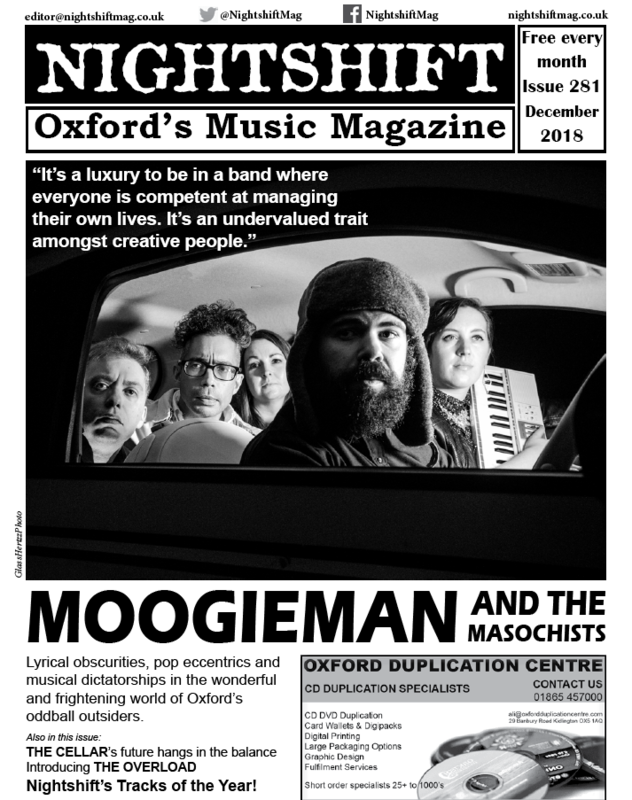 Oxford music magazine, Nightshift was kind enough to feature the band on the cover of their December issue. There’s also a double-page spread inside, containing an interview with Moogieman and the Masochists talking about the new Doppelganger EP, band politics, and oddball influences. The cover photo is by Jason Warner of glasshertzzphoto and we think he did a cracking job. Full article on the story page. Here’s what Oxford’s indefatigable music magazine, Nightshift, had to say about the forthcoming Moogieman EP. 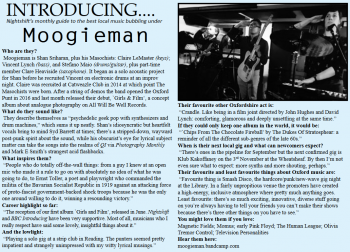 What the periodicals said about the new Moogieman album. After kicking off the year by joining All Will Be Well Records, Moogieman And The Masochists have a packed Spring calendar. First off, another All Will Be Well gig at the Cellar on 15 April, supporting the inimitable Club Soda, then a slot at the carnivalesque Klub Kakofanney on 6 May, and finally opening the annual Oxford Punt – Nightshift Magazine’s showcase of new Oxford bands (new defined as not having played the Punt before). In the run up to these events expect some promotional videos and also join the virtual release of Bloom – All Will Be Well Records label sampler vol. 2 on 1 April, featuring the new Moogieman track I Left My Camera On The Moon.